Place environmentally friendly housing for several small birds throughout your yard with these Audubon Recycled Plastic Wren Houses. This package of 4, classic shelters are wonderful for wrens or chickadees, thanks to their 1" diameter entry holes and convenient size. An overhanging, green roof on each home protects the interior from rain, and the front panels lift easily for nest checks. A metal latch keeps this door securely closed, and the extended, back panel makes it simple to place each home against a wall or tree. Crafted from post consumer plastic, each of these units aids in reducing waste in landfills, and their brown and green color scheme enhances your foliage. Invite many small songbirds to roost in your yard with these Recycled Plastic Wren Houses. Made in the USA. 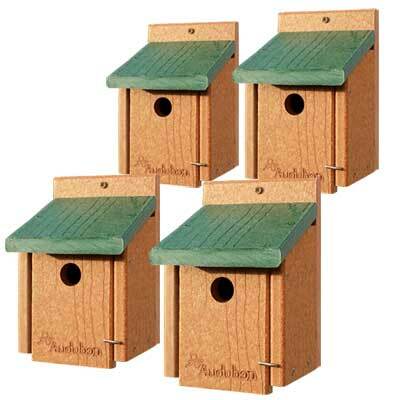 Note: This case pack contains 4 of the Audubon Recycled Plastic Wren Houses.